The data shows, without even beginning to account for everything, that the William Penn Foundation has invested over $10 million in just these few entities with the obvious purpose of frustrating as much growth as it can—in grants intended to advocate against such things as gas drilling and fracking in the watershed. Then, there is the money pushed out to the Delaware Riverkeeper, the Clean Air Council, Penn Future and myriad other groups to do the same thing, as well as the Delaware River Basin Commission (DRBC) itself when Carol Collier sold the agency’s soul to the Foundation even as the latter sued the DRBC through the Riverkeeper a/k/a Povertykeeper. And, this doesn’t account for relationships with the Rockefeller agents such as the Open Space Institute and other members of the NRDC gang. 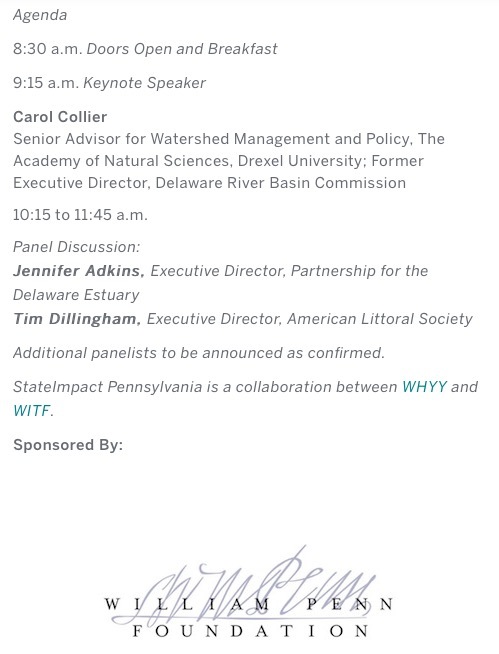 Most revealing, though, is the choice of keynote speaker Carol Collier, former DRBC Executive Director, one-time designated member of the board of the William Penn Foundation and now its DRBC leader in exile at the Academy of Natural Sciences. The Academy is a once respected outfit (much like the DRBC before her) that she is now already politicizing and taking down an ideological road. Yes, Carol Collier is back, having come up out of the depths of the Delaware to torment the innocent men, women and children of the Upper Delaware with a message, no doubt, that they must sacrifice themselves and their livelihoods for the greater good of environmental purity as defined by lower basin ideologues and the elitist Haas family and friends. And, their mere assertion of pollution stress is the only evidence required. This brings us back to the future. Will Carol Collier solemnly announce she’s now changed her mind and decided a ban is required after all; that her previous phony efforts to produce drilling regulations while dancing with the William Penn Foundation that immediately hired her after leaving the DRBC were mistaken? I suspect so. She’ll pay back the William Penn Foundation with an impassioned mea culpa and plea to enact a ban. StateImpactPA and NJ Spotlight will be there to ensure the message is echoed throughout the media and halls of Pennsylvania and New Jersey legislative buildings. Philly.com will be there as well, I expect, also being in the Haas orbit. That’s how the fractivist echo chamber works. Will the DRBC Commissioners cooperate in this sham enterprise? I would not be surprised, but they’re going to have a very difficult time defending their decision in court and especially in a massive takings claim somewhere down the line, which would be the clear direction into which landowners would ultimately be forced. The City of Harrisburg, Pennsylvania’s capital also gets its water from the Susquehanna, so, if the Governor’s own glass of water isn’t threatened by fracking he allows on the one hand, how is he going to credibly claim it’s a threat to the water he says he wants to protect on the other? It’s simply not a tenable position, which leaves me to wonder if they’ll really try this in the end. 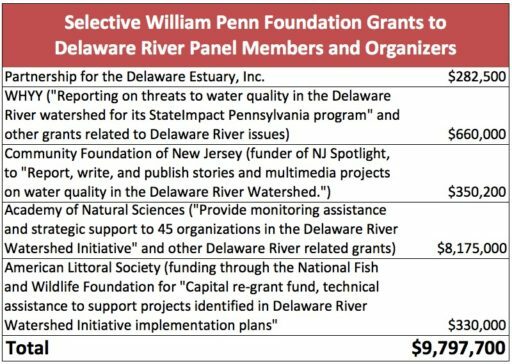 There’s no doubt what the William Penn Foundation wants, though. I fully expect to use this upcoming panel discussion as the basis to launch a more formal campaign for a ban using its surrogates and the echo chamber at its disposal, all bought with the inheritance of the Haas chemical fortune. How ironic and, yet, so typical of the trust-funder set. Hah, check out the DRBC website tomorrow. Given the fact there’s no one by your name working at the DRBC so far as I know, it appears you either lied about your name after assuring me Alphege Hamilcar is for real or you have inside information on the agency by virtue of your relationship with it; that is to say you work with some member government (DEC maybe?) or some group colluding with the DRBC (like the Riverkeeper for example). Which is it? Either way you have been deceitful but I’ll give you the last word before I cut you off. Whoa, easy there Tom I know you are upset, but this was public knowledge. Interesting that your IP address comes up as a Bristol, Pa address, the home of the natural gas-heated Delaware Povertykeeper offices and, no, it wasn’t public knowledge that something would appear on the DRBC website. You have lied repeatedly and proved exactly what you’re all about and I highly doubt this riduculous litigation strategy will work. But, we’ll see, won’t we?